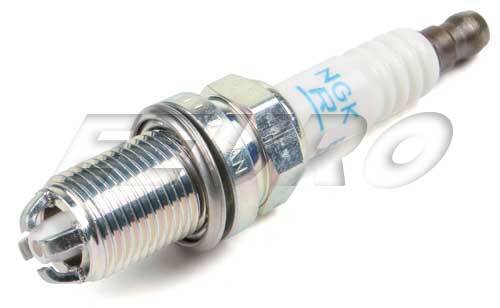 Platinum Spark Plug with 4 grounding electrodes, 14mm thread, 5/8 hex, 3/4" reach. Platinum equivalent of BKR6EQUA for Volvo applications. The spark plug is a critical component to the proper running engine. In a conventional gasoline engine, the air fuel mixture is ignited by the spark plug to drive the piston down and convert this energy to horsepower. If your spark plugs aren't in good shape, this crucial process can be severely hindered to the point of power loss, hesitation, misfires, and poor start up performance. Typical service schedule for standard copper tip spark plugs is between 10,000 and 30,000 miles. Iridium plugs have a more durable (but weaker) electrode that can last upwards of 60,000 miles, and platinum plugs can be rated to go as far as 100,000 miles before the electrode is spent. When replacing spark plugs, be sure to abide by the part numbers in your owner's manual for best performance, and always use dielectric grease to make a sealed and secure electrical connection. 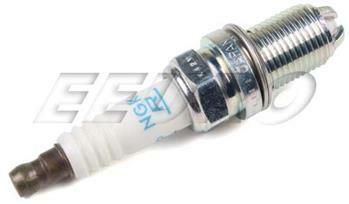 Laser Platinum spark plugs provide high ignitability and longer service life. Dual platinum surfaces ensure slow wear rate providing stable idle, superior anti fouling, improved fuel efficiency and lower emissions. If this is not the exact Spark Plug (Platinum) you are looking for, or you would like this part in a brand other than NGK Laser Platinum, please contact us and one of our customer service experts will help you locate the exact part you need. eEuroparts.com® proudly offers wholesale prices and fast shipping available on most orders. We also provide inexpensive and guaranteed 3 day, 2 day, and Overnight shipping options, so if you need your Spark Plug (Platinum) tomorrow, eEuroparts.com® can deliver! Every eEuroparts.com® order is track-able, meaning you'll know exactly where your Spark Plug (Platinum) is at every step of the shipping process. eEuroparts.com® also displays your Expected Ship Date and transit time in your Cart, making our entire shipping process simple and transparent.